I finally purchased my first Digiplexis Illumination Flame. I have been wanting to try it out for myself since seeing it in the nursery last year. At that time they were a rare new perennial. This year they are showing up everywhere! My friend just found one at Home Depot for $7.00! Incredible, seeing as they are selling for over $20 for a gallon size at the nursery. I am curious to see whether this plant can make it through our winters. I also look forward to the re-bloom over the summer. So, more info to follow, but it’s finally in the garden! Who else is growing Digiplexis Illumination Flame and how is it doing? Beautiful. I’ll be on the lookout for this. Incredible…I am off to the internet to find more information. I just promised to stop adding things to the garden this summer. I am going to have to figure out how to break that promise without breaking that promise. Wow! I love that. Is it related to the foxgloves? I’ll have to look for it too. 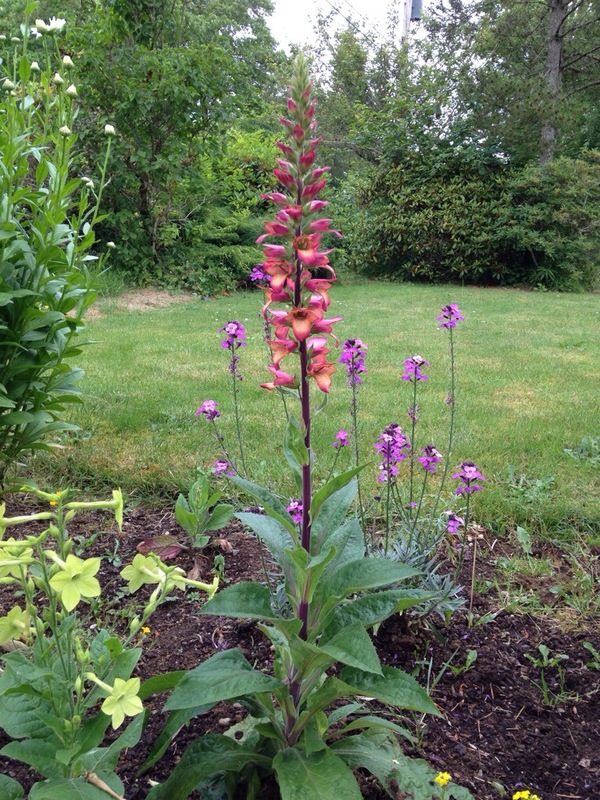 Yes, it’s a foxglove hybrid and it is stunning! I can’t wait to see how it does this winter…. I purchased mine from Fred Meyer in Ballard this year and it’s sending up more flowers. Hoping to mulch it enough to make it through the winter. Saw one that looked like 2nd year with longer stalks. I had a bare spot in the middle of the garden that called out for something special – and special it is! Good luck with it, I’m getting ready to dead-head mine after its first bloom, hoping for more! Being as it’s a biennial don’t you want to let it go to seed before winter so it doesn’t die out? I would think you might want to let it set some seeds, but I don’t know that much about it. This one produces a sterile seed because it’s a hybrid, but you are right, digitalis is a biennial. It’s a lovely bloom. I also got one this year, in full bloom a month ago and still blooming now. I’ve heard that they aren’t reliably hardy here but, like you, I wanted to try one to see. I am located in Zone 5 and just bought Illumination. Label says mild hardy in Zones in 8-10. Anyone in the Northeast have experience overwintering the plant with success? If so, what preparations did you make? This is my first season to plant it, so I’m waiting to see myself. I plan on not cutting it back until spring and mulching heavily around the base. From the reading I”ve done, my guess is it’s an annual in zone 5 and probably up to zone 8 as well. The new digiplexis ‘Berry Canary’ is supposed to be more winter hardy. Good luck, you never know what each winter will be like!